This week is the last call for Adobe’s Flash Player. While this shouldn’t come as a surprise, if you haven’t prepared for what’s about to happen, it’s probably time to start. Starting with Chrome 55 (which Google plans to release this December), Chrome will block Flash Player from loading in its browser. Other browsers, including Firefox, Safari and Microsoft’s Edge have announced that they will continue to minimize the usage of Flash Player in their browsers as well. This means that in order to stream videos using Flash, users will actually have to opt-in to loading the Flash Player. Since that’s not likely to happen very often, it’s time to make sure your videos don’t depend on the Flash Player in order to play. What’s the good news? Everything! 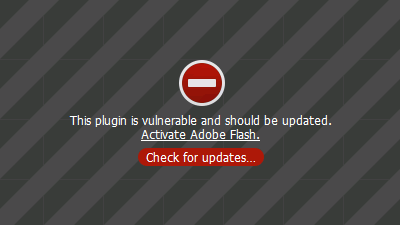 Flash Player is a legacy technology that is riddled with issues and security flaws. Did I mention that videos also crash more often and use more battery power with Flash Player? With an HTML5-based video player, streams will load faster and more efficiently. This also avoids the need for end-user Flash downloads and updates that are annoying at best and notoriously riddled with security flaws at worst. How To Handle The Change If You’re Using HLS? If you’re delivering HLS streams, don’t worry. The fix is here! HLS streams can either be played natively (on Safari) or using Media Source Extensions (MSE) (on virtually every other browser). How to Handle The Change If You’re Using RTMP? If you’re delivering RTMP streams, the solution is less obvious. RTMP is a proprietary technology that belongs to Adobe and is exclusively supported by the Flash Player. While there have been some attempts to replace RTMP with HTML5-based methods, including WebRTC, many web broadcasters have simply chosen to switch from RTMP to HLS, as HLS is a mature and widely supported protocol that works on both desktop and mobile devices. Need help migrating from Flash? Check out the guide we compiled. So goodbye Flash Player. You had a good run, but now, we’re moving on. Peer5’s Serverless CDN supports massively-scaled live and on demand video streaming. As the demand for ever increasing amounts of delivery capacity continues to grow unabated, no single CDN is able to provide all of the capacity, features, geographic coverage and uptime that broadcasters need. Hence, the growing momentum behind a Multi-CDN architecture and the load-balancing, redundancy and feature completeness advantages that this approach affords. Our novel peer-to-peer (P2P) solution solves the peak demand problem by creating a network that actually gets stronger as viewership increases. This means that we perform our best at the exact moment when traditional CDNs struggle the most – making Peer5 the perfect complement to a broadcaster’s existing CDN infrastructure. Register for your own Peer5 account here.